Back Paddock SoilMate® is a software and training services package that empowers advisers to provide professional advice on soils management and plant nutrition. SoilMate® is a proven and robust software application, a complete end-to-end system, with the application on your PC incorperating internet-based support systems. SoilMate® software saves you time and also helps you to keep your independence; interpretation of nutrient rates, product selection and ongoing access to client data are independent of any other product supply arrangements. There are a number of unique aspects to the support provided under the SoilMate® service that helps empower advisers to improve the quality of their advice. Using the SoilMate® package, you will be supported by a team of specialists in soils, plant nutrition, fertiliser products and agricultural IT. The focus of this team is to improve farm returns through soils management and plant nutrition, rather than sales of a fertiliser product range. We are specialists in systems that suite commercial advisers. Back Paddock is actively involved in scientific research in plant nutrition and the development and delivery of industry training programs for soils management, plant nutrition and fertiliser application to advisers in Australia. Our specialist knowledge and ability to put together scientific information on fertilisers and plant nutrition can help advisers to cut-through and assess product claims. The adviser has access to a comprehensive list of the fertiliser products available from most of the key suppliers to the Australian market. This list is updated on an ongoing basis as products change in the market. The adviser also has the ability to insert products into the product file. The SoilMate® interpretative data and models are based on the latest data available in scientific literature, combined with practical verification by experienced agronomists on a regional basis. Being independent of any fertiliser product sales, SoilMate® is uniquely placed to help advisers and farmers better understand the overall economics of fertiliser use, to provide a balanced view of soil health and a recommendation that addresses both fertilisers and soil amendments. Back Paddock Company is a specialist in training programs that work for advisers and farmers in the field of soils management and plant nutrition. Further information on our background in this field is available at Back Paddock Training. The programs are developed and delivered by people who work commercially in this field and are the leaders in their field. The SoilMate® package offers a range of training programs that are of a very high quality and incorporate the latest information from all the leading sources in our industry. Agronomists with a strong background in soils/plant nutrition wanting to achieve FAA Accreditation. Audit of recommendations is also required. Experienced users seeking FAA and/or a refresher. *BSM has been assessed by an RTO as meeting Fertcare requirements for ‘initial competence’. 14 Online Modules including self-paced texts, graphics, audio and video tutorials. Successfully passing a quiz at the start of each module allows users to ‘jump ahead’ to the next module. 4 Webinars: Held over the month prior to the face-face workshop, these provide the forum to address questions, key principles and explore key local issues direct with technical staff. Segment Coverage:: The courses are relevant to all agricultural segments – broadacre crops, pastures, horticulture, cotton, dairy and sugar. Courses are delivered nationally but with a Regional crop segment focus. Fertcare C: The 1-day Fertcare Level C course is provided the day after the BSM 1-day face-to-face workshop. 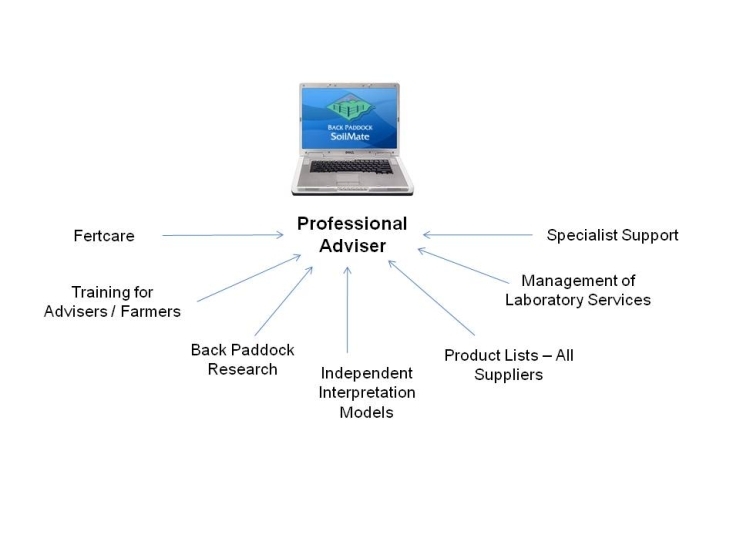 SoilMate: Fertcare-assessed nutrient advisory system; the only system that provides advisors with a choice of Fertcare-compliant laboratories while complying with Fertcare Accredited Advisor requirements. Training in SoilMate® software use is via a Remote Training Manual to enable self-paced learning at a speed to suit the adviser; A User Guide is availbale online to enable ongoing refresher on use and use of extended features. Many farmers are seeking more from their fertiliser advisory services. They want to better understand the potential economic returns of one of their most important investment decisions each year, while taking care of the health of their soil in the longer term. Advisers have found that training for farmers has helped foster a more effective adviser-farmer relationship in this area. The SoilMate® training package addresses these topics as a specialist in the soils/plant nutrition field, independent of fertiliser product sales. The SoilMate® package has been developed to meet requirements for ‘advisory systems’ under Fertcare Accreditation. Like all other methods for providing fertiliser advice, the SoilMate® system is currently awaiting availability of assessment against these requirements. Given successful completion of these requirements, the SoilMate® system will provide the adviser with the necessary steps in terms of training and/or assessment in order to readily meet requirements for Fertcare Accreditation. Our adviser training courses under the SoilMate® package, such as Better Soils Management, have been mapped to competency standard requirements of Fertcare Level C.
Ongoing competency as a Fertcare Accredited Advisor will require a biennial audit of live recommendations. The SoilMate® system is fully compliant with the requirements for ongoing accreditation. SoilMate® software provides very significant data management benefits for the advisory service business. The adviser maintains control of all client data (test results, fertiliser programs) in a database on their PC. From this position, the adviser is able to ensure the confidentiality of this data, compared to situations where data is held in a system owned by a fertiliser supplier or laboratory. With this greater control, the adviser can build quality client data as an intellectual property asset of their business, of considerable value over time. Holding data in a database on the advisers’ PC enables easier storage, retrieval and interrogation of information over time compared to use of spreadsheets. The ability to readily retrieve data and look at trends over time is important for monitoring changes in soil health and fine tuning plant nutrition requirements. The use of SoilMate® to generate professional advice involves an easy 6 Step process, which is outlined below. The adviser arranges for the soil/plant sample to be collected. It is a critical step for the success of the Investment that sampling is done correctly. SoilMate® training sessions for advisers and farmers cover correct sampling methodology. SoilMate® has an extensive range of both soil and plant tests available. The adviser pre-logs the sample details into the particular paddock in SoilMate® software on the PC, and also logs the basic purchase order details on the SoilMate® website. All laboratories use methodology which can be interpreted for Australian conditions, and all have an Australian Soil and Plant Analysis Council Certificate of Proficiency for the key tests provided under the SoilMate® range. SoilMate® helpdesk keeps advisers updated on lab performance with regular reports on sample turnaround time during peak seasons. Payment for samples occurs on-line when downloading data, by credit card or direct debit. Electronic import of laboratory results into the software saves time compared to more manual or semi-automated arrangements with spreadsheet templates. Despite the comprehensive interpretation available in SoilMate®, this step is fast and easy and saves advisers a large amount of time in comparison to more manual systems. Developing a comprehensive product recommendation is greatly facilitated by SoilMate® software. Favourite product recommendations can be readily included, providing the adviser with considerable time savings. The adviser’s logo can appear at the top of the reports. In order to obtain the best economic return on fertiliser investments, it is important that the adviser understand the overall economics of management options, on a paddock-by-paddock and whole farm basis. In future SoilMate® will link to mapping and whole farm planning software which is currently the leading farm planning software used by advisers in Australia – Back Paddock Adviser. This will enable the adviser to provide a valuable service to the farmer, presenting the fertiliser program in the context of a whole farm budget showing gross margins and cash flow. The mapping capability of BP Adviser makes it an ideal tool to support Precision Agriculture programs. Fertiliser programs can also be presented on a map. These products, plus the exclusive control of your client information means you can build the intellectual property value in your business. On paying for a SoilMate® licence the Adviser receives an email with a valid Product Key. and organise your 'Getting Started' training session. The SoilMate® Remote Training Manual enables self-paced learning to get started in use of software. This manual uses a step-by-step approach, with worked examples. The adviser can complete case studies and submit to one of our agronomists for feedback on software use and recommendations. It is recommended that advisers take advantage of this free service when first commencing use of SoilMate®. The SoilMate® User Guide is available online to enable ongoing refresher on use and use of more advanced features of the software. Licence fee - $795 per year. Licences are available to advisers in the Australian states of QLD, NSW, VIC, SA and NT. ® SoilMate is a registered trademark of the Back Paddock Company.